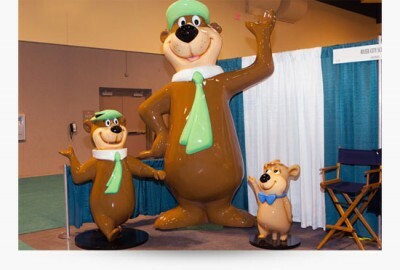 Just think of how thrilling it is for a child to meet Yogi Bear™, to see a 10-foot statue of him waving, or to get his picture taken holding hands with Boo Boo™. It’s exciting for parents too! There is an abundance of opportunities for signage and statues to theme your park, and every event becomes extra special when a costumed character arrives on the scene. These moments create lasting memories for guests that will bring them back to your campground over and over. Other campgrounds can’t compete with that! 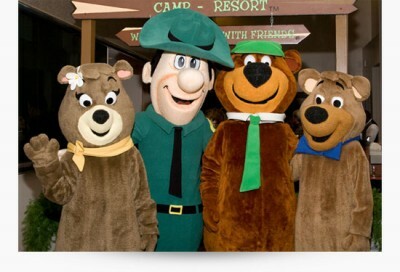 As part of our Franchise Package, each park receives a 10 foot Yogi Bear™ statue, Yogi Bear™ character costume and credit towards a front entrance sign. These items have a combined value of over $11,000! The franchise package includes a Yogi Bear™ costume. Parks can also purchase Cindy Bear™, Ranger Smith™ or Boo Boo™. The franchise package includes a 10 foot Yogi Bear™ statue. 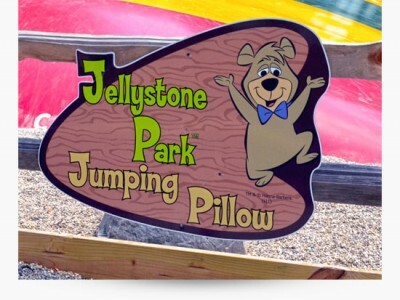 Parks can also purchase a 5 foot Yogi Bear™ or 3 foot Boo Boo™. A sample of our facility signage with cartoon elements that create a unique atmosphere. A Yogi Bear™ statue on a park bench makes a great photo op. The franchise package includes a $2500 credit towards an entrance sign.